Select for each finger nail the right tip - artificial fingernail from. A perfectly fitting tip is to the left and right on the nail bed and overlaps the nail at approximately. 5-6 mm. Enter a drop of glue on the tip Underside of the tip, lift it a little back and forth, so that the glue evenly distributed fine. Now set the artificial fingernail on your natural nail and hold in about. 10 Seconds and exert slight pressure on him. Any residue of adhesive removed with the Cleaner. All tips are clean and just stuck, the transitions filed by the natural nails to the tips smooth. Always start with a coarse file, then a fine file and the grand finale is a micrograph of the buffer. Always remove the dust with the dust brush. In order to apply the good succession UV gels can, roughen the nail gently with the buffer, The surface must be dull again. Days on the primer-gel and let it harden in the light curing. Subsequently, the French-gel coated and cured. In order to strengthen the nail, now is building gel is applied and cured. 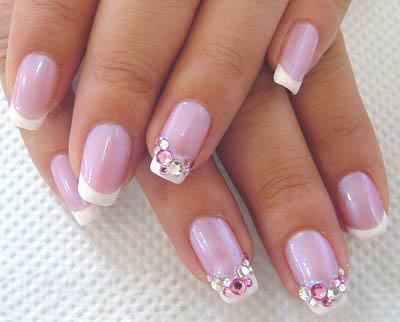 If the nails perfectly modeled and refined, is the sealing gel applied. This is the final and give your nails a glossy finish.